A violent crime occurs in our country about every 25 seconds. And, a suicide occurs about once every 13 minutes. These statistics are a little startling and show that many crime scenes need to be cleaned in our country every single day. 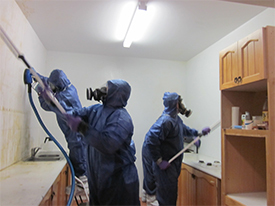 Crime scene cleanup is not something that you need to think about on a daily basis, but when you or a loved one is a victim, it is a service that you will need quickly. Just like any state in the USA, Louisiana has its fair share of crimes. Research shows that Louisiana had the highest murder rate in the country in 2012, which was 10.8 murders per 100,000 people. It would make sense that New Orleans, LA averages the highest number of murders in the state. Additionally, studies indicate that Louisiana also led the nation with the highest incarceration rate during 2013. What happens to these crime scenes after law enforcement and detectives pull out any needed evidence? The mess is left to the owner of the location. There are many different kinds of crime scenes, but they all have one thing in common - a traumatic or unlawful event occurred in the affected area. Whether the crime was a murder, suicide, drug operations, assault or burglary, crime scene cleanup will be a very important part of the healing process. This cleanup is best left to a professional company with experience with timely cleanup, decontamination, sanitization and biohazard disposal. If you find yourself in need of any type of Crime Scene Cleanup in the New Orleans or Baton Rouge, Louisiana area, the professionals at KBI can help.